Ah, neon. Perpetually the lighting of choice in the future. Let’s clarify something from the get go. Cobalt has nothing to do with Minecraft other than Mojang being the publisher. Still, that association likely drew added attention to developer Oxeye’s second-ever release. Cobalt is an interesting mix of platforming, exploration and quick-twitch action, but even with a lot of things working in its favour it still stumbles all too frequently. As Cobalt, you are equipped with three different weapon types: melee (X), ranged (Y) and grenade (B). You tap the associated button to equip a type and then tap again to cycle through your options within that grouping. It works as designed with one notable caveat. The smallish icons that appear over your head are hard to identify, and as a result it’s too easy to make mistakes in selection or exhaust a gun’s ammo. When moving, your gun will automatically aim forward, or you can also auto-target enemies by pushing down (sneak) or up (duck) on the left stick. Like many things in Cobalt, the system functions well until it doesn’t — such as when the game throws multiple enemies at you at once. Allowing use of the right stick for manual aiming might’ve helped, but instead you’ll have to function with what’s there. Defence is an important part of the gameplay, too, and the game equips you with a double jump and an evasive roll. While the former is straightforward, the latter can be used to deflect projectiles with the game entering a Matrix-inspired bullet time when they get close, allowing you to time your rolls with precision. If they strike your head they’ll be returned to their point of origin, but if they clip your feet you’ll still take damage. It’s actually quite a bit to digest, especially on the fly, and even after successfully completing the tutorial there are still likely to be some growing pains. Once you get more comfortable with the bullet time sections, though, the gaming experience improves markedly. Although not overly impressive, even by modern Indie standards, Cobalt has a pleasant look and some nice detailed features. The problem is so much of what’s happening is tiny. Even on a 55-inch screen we couldn’t read the report Cobalt types up as he progresses in the story without getting really close. As noted, it affects inventory management as well by making it hard to make out numbers and icons. It’s great that the developers wanted everything to seem like an extension of your robot’s HUD, but when said robot is such a small character it’s a real problem. We’d sign off on double magnification and take the immersive hit to be able to easily read and identify objects. Probably the single best thing about Cobalt is the soundtrack. The music is varied and interesting, and it immediately drew us into the game. Beyond the pulse-pumping tunes, sound effects are solid. Bad stuff happened, and you’ve been sent to investigate. Those are the broadest of strokes for the story mode in Cobalt, which represents the main single-player adventure. It’s a surprisingly lengthy excursion — north of 10 hours — that hits plenty of high and low notes along the way. At the heart of the game is a mix of modest platforming, exploration and timing-based combat. When it all comes together it can be very enthralling as you fend off enemies, deftly deflecting bullets and smacking explosives back at your foes. Exploration is usually rewarded with new items, ammunition or additional in-game currency. 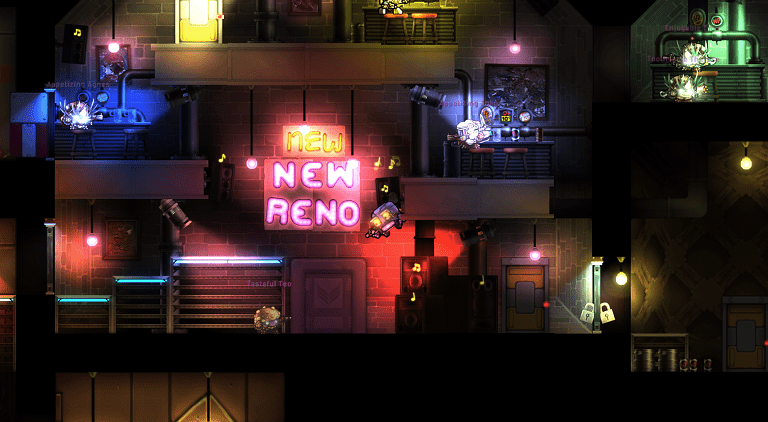 Unfortunately, Cobalt’s level design seems at odds with the type of gameplay it’s promoting. Enemies are routinely placed off screen, waiting for you to enter a zone and quickly dispatch you for an unfair death. There are also issues with the checkpoint system and some notable difficulty spikes that will quickly spoil the “game over” screen’s attempts at humour. What we ultimately found is that slow, deliberate progression is the best way to move through the game. One other problem worth noting is the developers didn’t do a very good job of explaining how things work. At one point we were stuck at a boss fight that was prompting respawn after respawn, but we absolutely couldn’t figure out why sometimes we’d blow up and get an additional life (or lives) and others we’d have to reload immediately. All action was taking place in one room. What was different? Multiplayer fares better than the story mode, and the fast-paced action is embraced when in a group of other players. The lobby could stand to be more user friendly, and the player base has been a bit discouraging so far, but when you’re actually playing the game it’s pretty fun. There’s also a sizable suite of contained single-player challenges in the Arcade mode. These bite-sized missions provide a focused task (speed or combat based) and then your completion time or score is uploaded to compare with others. While there are issues when playing solo, there’s no doubt the game has been packed with loads of content. It seems like every time Cobalt takes a step forward it almost immediately takes one back. We could rattle off a half-dozen really good things about it, and just as quickly amend each of them with a “but.” If the core gimmicks click with you, it’s worth downloading. If you frustrate easily, however, you might want to pass on this and keep your blood pressure from spiking. This entry was posted on Thursday, February 11th, 2016 at 8:33 pm	and is filed under Herija Green, Video Game Reviews. You can follow any responses to this entry through the RSS 2.0 feed. Both comments and pings are currently closed.